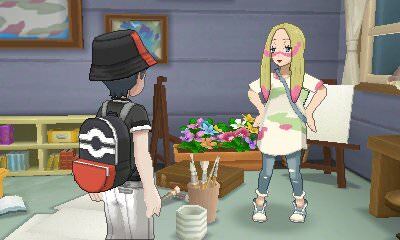 Walkthrough: After saving Nebby from the likes of Necrozma and returning the light to The Alola Region, you can finally take on Captain Mina's Trial back in Seafolk Village. Unlike every other Island Trial you faced before this, Captain Mina's Trial will begin by battling her. She is a Fairy Type Pokemon User. After defeating her, you will be given the Pink Petal. However, her Trial is far from over. Instead, you must then travel back around The Alola Region, battling the previous Trial Captains in order to receive a specific colored Petal from them. You will have to start with Captain Ilima, who can be found in Hau'oli Cemetery. As you arrive, you will actually run into Hau once again, who will tell you how he continues to get stronger. You can then find Ilima by one of the graves. Captain Ilima - Level 51 Gumshoos, Level 51 Smeargle, Level 51 Komala After defeating Ilima, he will give you the Orange Petal and will take you to Lush Jungle. Once in Lush Jungle, you will battle Captain Mallow. After defeating Captain Mallow, you will be given the Green Petal from Captain Mallow and the Blue Petal from Captain Lana. You will then be taken to Wela Volcano Park to battle Captain Kiawe. Captain Kiawe - Level 51 Arcanine, Level 51 Talonflame, Level 51 Marowak After defeating Captain Kiawe, you will also have to battle Hiker David once more, this time with his Magmar at Level 48. After winning both battles, you will receive the Red Petal. Once you have obtained it, you will be brought back to the Hokulani Observatory to battle Sophocles. As you arrive there, Molayne will be saying goodbye to his cousin, telling of a new adventure he is about to embark on. Once he departs, Sophocles will battle you. After defeating Sophocles, you will receive the Yellow Petal and be taken to Aether House to challenge Acerola. However, after you arrive, Kahuna Nanu will inform you that Acerola has left to assist Professor Kukui, leaving the task of battling you on Kahuna Nanu. Since Nanu just lost to Hau in his Grand Trial, he can't be bothered to battle again. He will give you the Purple Petal for nothing at all. Once you have received it, you will need to return to Captain Mina in Seafolk Village. After you do, she will use the petals you have obtained to create the Rainbow Flower. After giving said flower to you, the Totem Pokemon will arrive and battle you. The Totem Pokemon for Captain Mina's Trial is Ribombee. Ribombee will be at Level 55, having all of its stats increased as the battle begins. On top of this, the Totem Pokemon will also call upon help from Blissey (Level 53) and Pelipper (Level 52). After defeating the Totem Pokemon and all of its allies, you will complete your final Island Trial and obtain Fairium Z. Once finished, Hapu will come to you and tell you to meet her on Exeggutor Island for your Grand Trial with her.